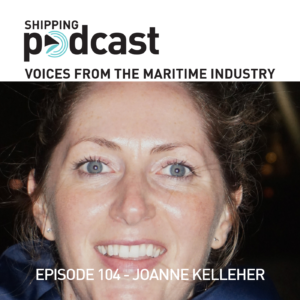 Joanne Kelleher studied at the Institute of Chartered Shipbrokers and in her Master’s degree study she asked 37 Maritime Professionals what they want from their industry leaders and got some interesting results. Joanne shared her insights in an article on LinkedIn, which I found very interesting, so I decided to try and meet Joanne for an interview and she agreed and that is what we speak about in this episode, the 104th. Do we have the leaders we deserve in the maritime industry? Traditionally, there has been an authoritarian leadership with clear commands, there is only one Captain of the ship! Is that changing? What kind of leaders does the #nextgen of shipping people want from a leader? How can the industry meet the requirements of the young generation? Is there a new leadership on the horizon? Joanne and I really get into the nitty-gritty of leadership, diversity, WISTA, female leaders, participatory leadership and being a leader in different cultures. I would really like to start a discussion on this topic. What is your view? In addition, what do you think of the new logotype and the new artwork? After 100 episodes it was time for an update. New & fresh, I would say.